You may have heard about Infant Potty Training, or “Elimination Communication,” a long-standing potty training method. More than half the world’s babies are toilet trained by the time they turn one, according to Contemporary Pediatrics magazine. The method calls for parents to whistle or make a “swooshing” sound to encourage the baby to pee, and as a conditioned trigger for going in the future. Mothers learn to read their babies’ body language to discern when a pee or a poo is coming, and hold them over the potty to go. This doesn’t mean tiny babies can do everything on their own. You’ll still have to teach them the new full routine when they’re toddlers. But it does mean that, with constant adult support, babies can learn to release their bladder and bowel contents on cue. The downside, of course, is you need to be at your baby’s side 24 hours a day, 7 days a week, which simply isn’t realistic for many families today. 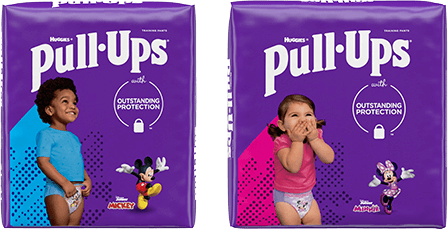 The Pull-Ups® Potty Partnership is an approach based on the tried-and-true potty training methods supported by the American Academy of Pediatrics and the American Academy of Family Physicians, and they have been proven successful in millions of families. Learn a whole new way to potty train with the Pull-Ups® Potty Partnership.